Your entry door is the gateway between your home and the outside world. It provides a sturdy barrier against cold, snow, and other winter hazards. But over time, it isn’t unusual for doors to develop problems that limit their performance. Here is a closer look at some common maintenance issues that occur during the winter. If you can feel cold air around your door, you have an energy-sapping problem. This is caused by deteriorating weatherstripping or an improperly installed door sweep. 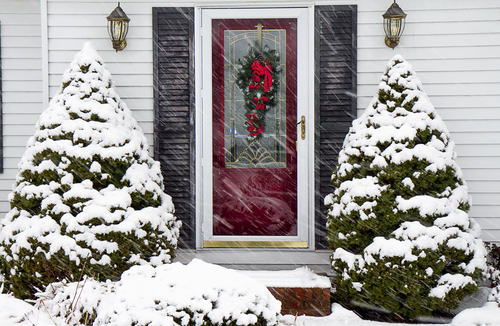 New door sealing products will prevent heat loss in this area, so you can reduce winter heating bills. Best of all, installing new weatherstripping can be accomplished in a few minutes by a skilled professional. As temperatures rise and fall throughout the winter, the wood used to construct the entry door and the door frame itself will expand and contract. When there is too little space between the wood and the jamb, the door will tend to get caught on the threshold and become harder to open or close. Replacing the screws in the door jamb can help correct the problem. Extremely cold temperatures can actually freeze your locks, making it impossible to get into the house. You can prevent this problem by oiling your locks and keeping moisture out of the internal mechanism. Frozen locks can often be fixed by inserting a heated key into the lock or by using a specialized de-icing product. Sometimes, the interior of the lock will need to be removed and cleaned to prevent future freezing mishaps. If you need to repair or replace an entry door, contact Murphy Home Improvement. Serving the Cincinnati, OH area for over 30 years, their NARI award-winning team uses top brands to give you long-lasting results. To learn more about their home improvement services or to set up an appointment at their showroom, visit them online or call (513) 922-8989.